Push notifications explained using astrology. But don’t worry, there’s also some code, just in case you prefer your explanations to also include models that actually work. The only time my phone is allowed to ask for my attention is for phone calls, SMS, or FaceTime (all rare occurrences). I initiate every other interaction—Twitter, Instagram, Foursquare, the web. My phone is a tool that I control, not the other way around. To me, this seems like a perfectly sensible thing to do. I was surprised by how others thought it was radical and extreme. I’m always shocked when I’m out and about with someone who has their phone set up to notify them of any activity—a mention on Twitter, a comment on Instagram, or worst of all, an email. The thought of receiving a notification upon receipt of an email gives me the shivers. Allowing those kinds of notifications would feel like putting shackles on my time and attention. Instead, I think I’m applying an old-school RSS mindset to app usage: pull rather than push. Don’t get me wrong: I use apps on my phone all the time: Twitter, Instagram, Swarm (though not email, except in direst emergency). Even without enabling notifications, I still have to fight the urge to fiddle with my phone—to check to see if anything interesting is happening. I’d like to think I’m in control of my phone usage, but I’m not sure that’s entirely true. 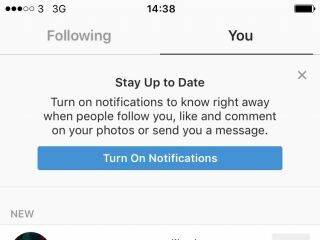 But I do know that my behaviour would be a lot, lot worse if notifications were enabled. I was a bit horrified when Apple decided to port this notification model to the desktop. There doesn’t seem to be any way of removing the “notification tray” altogether, but I can at least go into System Preferences and make sure that absolutely nothing is allowed to pop up an alert while I’m trying to accomplish some other task. It’s the same on iOS—you can control notifications from Settings—but there’s an added layer within the apps themselves. If you have notifications disabled, the apps encourage you to enable them. That’s fine …at first. Being told that I could and should enable notifications is a perfectly reasonable part of the onboarding process. But with some apps I’m told that I should enable notifications Every. Single. Time. Of the apps I use, Instagram and Swarm are the worst offenders (I don’t have Facebook or Snapchat installed so I don’t know whether they’re as pushy). This behaviour seems to have worsened recently. The needling has been dialed up in recent updates to the apps. It doesn’t matter how often I dismiss the dialogue, it reappears the next time I open the app. Initially I thought this might be a bug. I’ve submitted bug reports to Instagram and Swarm, but I’m starting to think that they see my bug as their feature. In the grand scheme of things, it’s not a big deal, but I would appreciate some respect for my deliberate choice. It gets pretty wearying over the long haul. To use a completely inappropriate analogy, it’s like a recovering alcoholic constantly having to rebuff “friends” asking if they’re absolutely sure they don’t want a drink. I don’t think there’s malice at work here. I think it’s just that I’m an edge-case scenario. 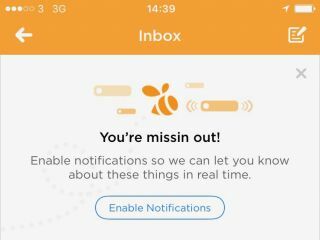 They’ve thought about the situation where someone doesn’t have notifications enabled, and they’ve come up with a reasonable solution: encourage that person to enable notifications. After all, who wouldn’t want notifications? That question, if it’s asked at all, is only asked rhetorically. I’m trying to do the healthy thing here (or at least the healthier thing) in being mindful of my app usage. They sure aren’t making it easy. That must seem like the stuff of nightmares for growth-hacking disruptive startups looking to make their graphs go up and to the right, but it’s a wonderful example of truly user-centred design. In that situation, the browser truly feels like a user agent. Oodles and oodles of videos of talks from London developer meetups. A nasty service that Harry noticed in his role as chronicler of dark patterns—this exploits the way that browser permissions are presented below the line of death. Scott runs through the latest improvements to the Filament Group website. There’s a lot about HTTP2, but also a dab of service workers (using a similar recipe to my site). A delightful online book that makes excellent use of HTML5's history API. Anil Dash writes about the realtime web, calling it Pushbutton.